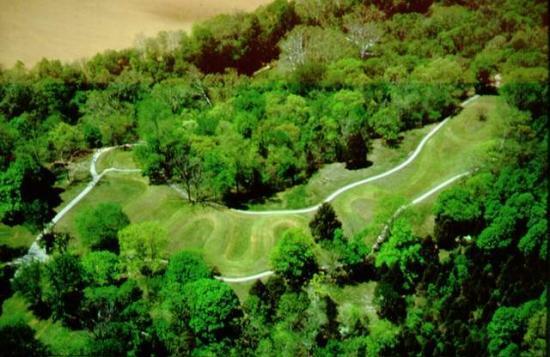 LOCUST GROVE - Scientists have been trying to uncover the secrets of Serpent Mound for 165 years. A new effort, which will include ground-penetrating radar and radiocarbon dating of soil samples, is to begin April 8 at the Adams County earthwork. Nearly a quarter-mile long as measured by the centerline of its curves, Serpent Mound is the largest prehistoric effigy of its kind in the world. It was built on a ridge above the valley of Ohio Brush Creek by an unknown people, perhaps 1,000 to 3,000 years ago. Proving when it was built could indicate who those people were - and why they undertook an engineering feat that demonstrates a sophisticated understanding of geometry and astronomy, said William F. Romain of suburban Cleveland, an archaeo-astronomer who will lead a team of archaeologists. "We expect to generate a new and detailed understanding of the serpent's internal structure," Romain wrote in seeking a permit from the Ohio Historical Society, which owns the site. "Our goal is to provide a series of graphic illustrations." The site was surveyed for the Smithsonian Institution in 1846. Frederic Putnam of Harvard University, who excavated the site in 1887-89, noted that clay mixed with ashes was used to outline the effigy before the mound was built. "If we can locate this foundation feature, it might provide the needed charcoal to assess when the Serpent Mound was built," Romain said. A 1991 excavation radiocarbon dated three charcoal samples. They varied from 970 B.C. to A.D. 1070, and it was suggested that the mound was built about 1,000 years ago - but those samples weren't from the foundation layer of ash, Romain said. "If built 2,000 years ago, it tells us native American cultures were even further advanced than is generally credited," Romain said. Solving the mystery of the mound would bolster a request that it be recognized as a World Heritage Site by the United Nations Educational, Scientific and Cultural Organization, Romain said. Designated Ohio's first state memorial in 1900, Serpent Mound is already a National Historic Landmark. It draws about 23,000 visitors annually, but World Heritage status could boost tourism. Romain, a research associate with Ohio State University's Newark Earthworks Center, said no state or federal money will be used for the investigation, which could take several months. The park at 3850 Ohio 73, which encompasses 54 acres a few miles north of the hamlet of Locust Grove, will remain open during the effort. Members of the public who climb the stairs of a 25-foot tower, built in 1908, might spot the archaeologists in action when they begin work at the site April 8 and 9. It's unlikely to be as exciting as watching a traditional archaeological dig. "We're not actually excavating," Romain said. About 20 core samples, taken from 3 to 8 feet deep, will be analyzed at a lab at Indiana University. The height of the mound varies from 2 to 6 feet, while the serpent's body is about 20 feet wide and 1,348 feet long. "The coring is going to be down the centerline of the effigy," Romain said. "Analysis will take several weeks. It could be a couple months before we have a definitive answer." Romain hopes to deduce whether the mound might have been built by one of three cultures of Indians who lived in the area at different times: the Adena, Hopewell and Fort Ancient. "The meaning of the serpent effigy may relate to who built it," Romain said. "We're not ever going to know for certain what the meaning of (this) ancient symbol is. The best we can do is assign likelihoods." Some speculate Serpent Mound represents a solar eclipse. Just beyond the mouth of the snake is a separate oval mound, which might be a depiction of the sun. The mouth of the serpent aligns with the setting sun on the longest day of each year: the summer solstice. It has been suggested the outer curves of the serpent align with movements of the sun and moon, but that has not been resolved, said Romain, who has been studying the mound for 25 years. The configuration could be linked to the best times to plant and harvest corn, said Brad Lepper, an archaeologist with the Ohio Historical Society who was part of the 1991 excavation, which reopened a trench dug by Putnam. "The other notion is it was purely religious, and they worshipped the sun as some kind of spirit," Lepper said. Serpent Mound may have been a shrine to the sun.